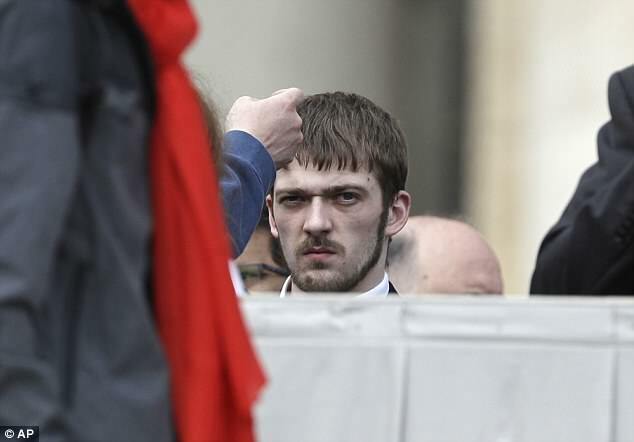 Alfie Evans' has today met the Pope to plead for more help to save his brain damaged son after flying into Rome last night. Tom Evans, 21, and Kate James, 20, who are Catholic, have been fighting a legal battle to move their 23-month-old son, who suffers from a degenerative neurological condition, to a hospital in Rome for treatment. Today Mr Evans had a 20 minute private audience at the Vatican where the Pontiff agreed to ramp up the campaign to stop his life support being switched off by Alder Hey Hospital in Liverpool. Alfie's father also asked the Pope to consider granting his son asylum and told him: 'Please help us save our innocent child and give us the grace of asylum to keep our family safe and to stop all of this. 'If your holiness helps our child you will be potentially saving the future for our children in the UK, especially the disabled. 'We pray the problem we are facing is solved peacefully and respectfully no child deserves this, especially not a child of God'. In the 20 minute meeting set up by an Italian bishop the Pope offered new support from the Vatican's secretary of state to ensure a 'decisive diplomatic channel is opened up for Alfie' and to ensure 'the dignity of his life is respected'. Tom Evans has asked the Pope to grant his son asylum. Charlie Gard, a British child who died last year, was even given legal and permanent residence in the US by Congress in order to allow him to fly to America for treatment. But legal sources said at the time that because he was the subject of a High Court order and it makes no difference what passport he holds. Pope Francis this week used his traditional Sunday blessing in St Peter's Square to say he's praying for British brain damaged toddler. 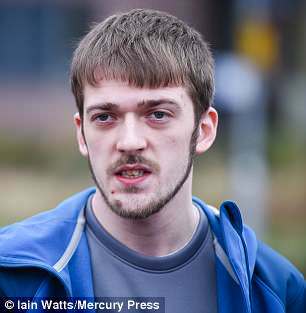 Supreme Court justices have been asked to consider the case for a second time after his parents argued he is being wrongly 'detained' by doctors they claim are keeping him prisoner. Their campaign has support from thousands across the globe, especially from within the Catholic Church, but Alfie's doctors are 'unanimous' that any more treatment would be 'futile'. Alder Hey had won the legal right to withdraw life support last week but the series of court challenges has delayed this. Alfie's parents have called on supporters to stop protesting outside the hospital where he is being treated as police investigate alleged threats against staff. Tom Evans, 21, and Kate James, 20, have been fighting a legal battle to move their 23-month-old son, who suffers from a degenerative neurological condition, to a hospital in Rome for treatment. Q&A: Can Alfie be saved at the 11th hour? Can doctors end Alfie's life against his parents' wishes? Alder Hey Hospital took Alfie's case to the High Court and a judge agreed to allow them to end his treatment because it was not in his best interests. The Court of Appeal, the Supreme Court and the European Court of Human Rights all rejected appeals by his parents, who believe they should have the final say on their son's treatment. In Britain the rights of the patient override the wishes of the parents if doctors disagree. For example there are several cases where Jehovah's Witnesses are given a blood transfusion by doctors despite religious objections from parents. Can the doctors change their mind and not turn off his life support? Yes. Alder Hey could go back to the High Court to stop the order they fought for this year. The process of gaining a Consent Order could be done on an urgent basis and completed in less than two hours. Experts have told MailOnline this is the only way he could travel to Rome for treatment. Can the hospital stop his parents taking him out of the country without permission? Yes. If doctors believe that any parent will cause suffering to their child, police can be called in to arrest them using Powers of Protection legislation. In the case of young cancer sufferer Ashya King his parents faced a European Arrest Warrant after absconding with their son who was in hospital. Alfieis on a ventilator so would require a team of medical staff to move him and his equipment. If parents still refuse to accept treatment should be withdrawn, can the hospital end it anyway? Yes. Police could be called in to facilitate treatment being ended if parents were violently preventing it - although it is highly unlikely this would happen. Doctors are more likely to try to 'persuade' parents to let it happen. Hundreds of people have gathered outside Alder Hey Children's Hospital in Liverpool to show support, but police are investigating reports of 'verbal abuse and intimidation'. Mr Evans has now called on supporters to stand down the protests to minimise disruption to the hospital. He wrote on Facebook: 'Can I ask that after tonight I would really appreciate if everyone has a break from the protesting please? 'Me and Kate are so so so grateful for all your time you have put into it and support. We can not thank you enough. 'I will update you on where we go from here and if we get permission then that would be a good reason to demonstrate peacefully. 'Me and Kate need to focus on spending precious time with Alfie and focus on the next legal step, keeping the relationship with the staff at ease and peace and make sure no parents are being affected any more. The parents apologised over the reported threats yesterday. Mr Evans said in a statement yesterday: 'Deepest apologies from me and Kate James to the parents and staff effected by the protest/demonstration, it wasn't mine Kate's or anyone else intention to harm or cause conflict or upset. The family lost their latest legal fight at the Court of Appeal where they were asking judges to rule Alfie should be allowed to travel to a foreign hospital. Despite the decision, Mr Evans gave a defiant speech saying they are 'stronger than ever' and will never give up on the 23-month-old boy. After his speech (left), Tom shared a photo of Alfie with his eyes open (right). He wrote: He's fighting not dying, he's undiagnosed not terminal, HE HAS NOT GOT MITOCHONDRIAL!!!!! Chief Inspector Chris Gibson said officers 'recognise the sensitivities involved in this very difficult and sad situation'. 'Whilst many people have gathered to protest in a peaceful way, Merseyside Police is now investigating a small number of reports, some of which originate from social media, as well as instances of verbal abuse and acts of intimidation from those outside the hospital,' he added. 'This is extremely unhelpful for all concerned and we are investigating further to establish the full circumstances. 'We would like to remind the public that this is a hospital for sick children and it should not be forgotten that many families are going through extremely challenging and emotional times. The court heard on Monday that the protest outside the hospital has caused road blockages which stopped NHS staff and the family of other sick children from accessing the hospital. Lord Justice Moylan said: 'We are told that some members of hospital of staff could not get to the hospital because of road blockage and that some staff and family members in the hospital could not gain entry. The couple have already lost fights in the High Court, Court of Appeal, Supreme Court and European Court of Human Rights but may ask the Supreme Court to consider the case for a second time. 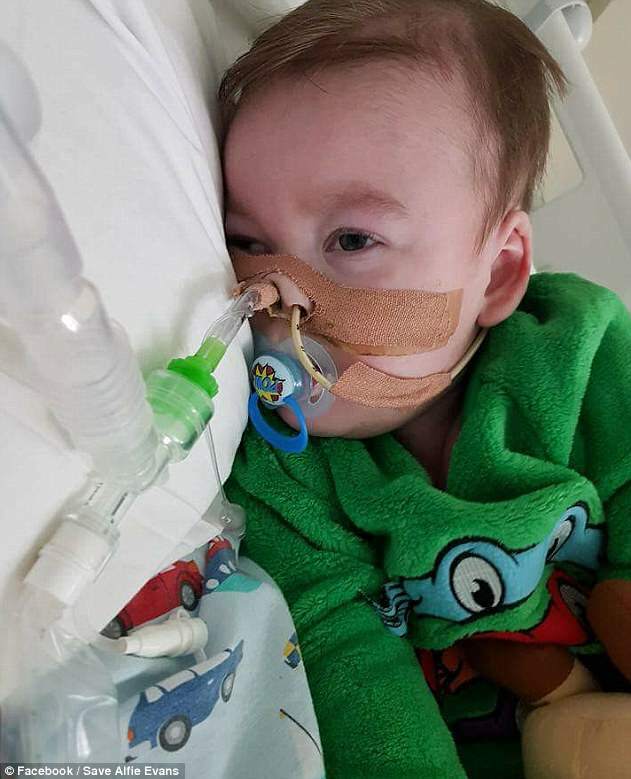 In February, Mr Justice Hayden ruled that doctors at Alder Hey Children's Hospital in Liverpool could stop treating Alfie against the wishes of his parents following hearings in the Family Division of the High Court in London and Liverpool. Alfie's parents say 'the state' is wrongly interfering with their parental choice. They want to move Alfie to a hospital in Rome. Mr Justice Hayden said flying Alfie to a foreign hospital would be wrong and pointless and the Court of Appeal judges upheld his decisions. What's next for Alfie Evans? Supreme Court justices might be asked to consider the case for a second time because his parents are using a piece of ancient English common law during the latest stage of their fight for treatment. They are now arguing that Alfie is being wrongly 'detained' at Alder Hey and have made a habeas corpus application. A writ of habeas corpus - Latin for 'you may have the body' - is a legal manoeuvre which requires a court to examine the legality of a detention. Last week, Mr Justice Hayden endorsed a detailed plan put forward by Alder Hey doctors for withdrawing life-support treatment, after considering a number of issues at a follow-up High Court hearing. Barrister Paul Diamond, who represented Alfie's parents, on Monday asked the three appeal judges to overturn decisions made by Mr Justice Hayden last week. Alfie's parents say their son has improved in recent weeks and had asked Mr Justice Hayden to allow a new assessment. Mr Hayden refused that request. He said medical experts' unanimous view was that Alfie's brain had been eroded by disease and further assessment was pointless. 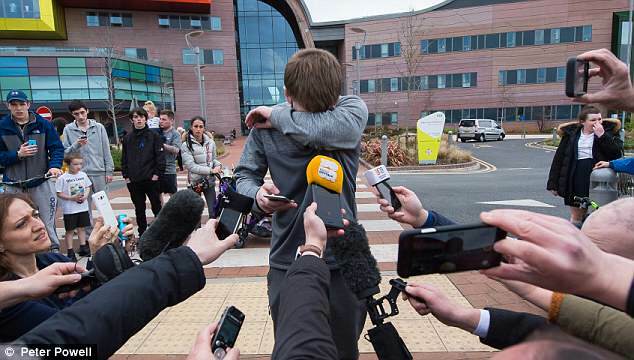 They also suggested that Alfie was being unlawfully detained at Alder Hey. The judge also dismissed that suggestion. Appeal court officials said an appeal court judge had decided that Alfie should continue to receive treatment pending the outcome of Monday's Court of Appeal hearing. Judges have heard that Alfie, born on May 9 2016, is in a 'semi-vegetative state' and has a degenerative neurological condition. 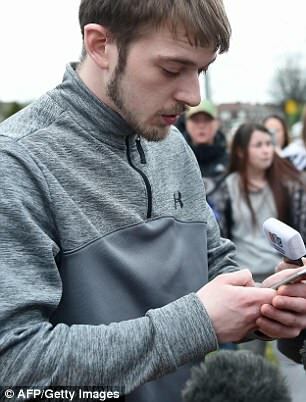 As news from the court filtered through to Alfie's supporters at the hospital, tears mixed with anger and police officers fanned out around the crowd, who began a chant of 'Save Alfie Evans!'. 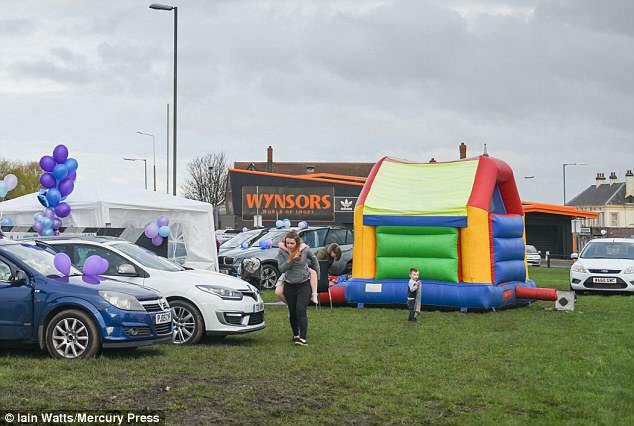 Alfie's doctors are unanimous that any treatment is 'futile' as the hospital caring for him urged protesters not to disturb other patients after a bouncy castle went up outside. Alfie's parents have also urged supporters to be 'respectful' after people visiting Alder Hey in Liverpool complained about the noise. 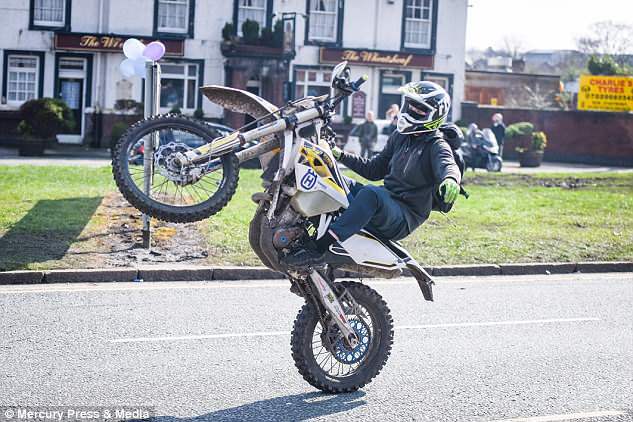 Men on scrambler bikes have performed noisy wheelies outside the children's hospital where Alfie has been since December 2016, while there were also reports of protesters singing through a karaoke machine and even drinking alcohol. Yesterday the Pope intervened in the case of the British boy, appealing for his life to be shown 'respect' as his Vatican children's hospital offered to treat him. Lord Justice Davis, who is heading the three-strong panel of appeal judges, told lawyers that at the start of the hearing that doctors had agreed that there was 'no hope'. A second appeal judge, Lady Justice King, said doctors' unanimous opinion was that Alfie 'could not be saved'. Alfie's parents were not at the appeal court hearing, which is expected to end in the next few hours. 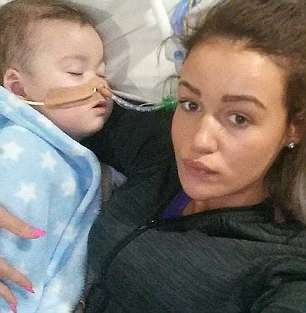 Alder Hey bosses have pleaded with Alfie Evans protesters not to disturb staff and patients with noisy demonstrations. The children's hospital urged campaigners backing Alfie's battle for survival to limit their noise due to the impact it was having on recovering patients. About 100 people were involved in a demonstration outside Alder Hey last night, with supporters chanting in support of the 23-month-old. Candles were lit in tribute and campaigners lined East Prescot Road as honking cars passed the gathered crowd. At one point they were addressed by Tom Evans from the roof of a nearby bus shelter. Alder Hey issued a statement in which it urged protesters to keep noise 'to a minimum'. It read: 'We would like to make people aware of the impact the current protests are having on our patients, staff and services. 'Noise from recent protests has unfortunately affected our patients, so we would ask that noise levels outside the hospital are kept to a minimum. 'Loud and constant noise such as from car horns affects sleep and raises anxiety levels for our patients especially when recovering from procedures, so please bear them in mind. For visitors, we have been advised to put additional measures in place so our patients and families are able to access vital services without limitation by others. 'For example tomorrow, visitors may see more security in the hospital and a more controlled approach to access to certain areas. 'This will help us maintain a flow to vital services, so please be patient. 'However, Alder Hey remains fully operational with A&E open for urgent and emergency care'. The latest demonstration comes on the eve of a court hearing over Alfie's future. The case is set to be heard in the Court of Appeal this morning after an emergency order was signed by a judge on Thursday night. Just days earlier, a date and time for the withdrawal of Alfie's medical support had been set. 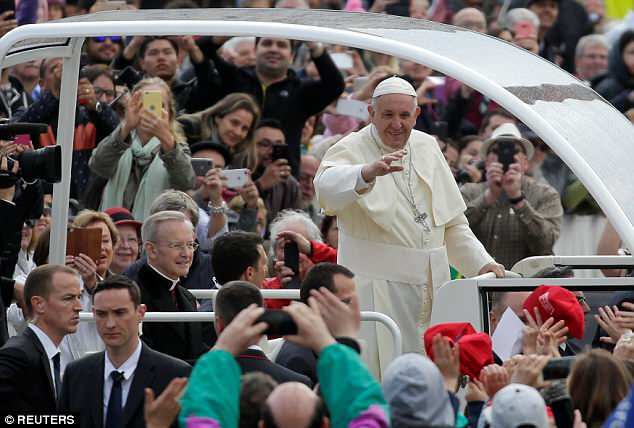 Pope Francis used his traditional Sunday blessing in St Peter's Square to say he's praying for British brain damaged toddler Alfie Evans. The pontiff said the situation is 'very painful and complex' as he spoke on Alfie and others who are terminally ill.
Francis' comments mark the second time in less than a year that he has intervened in the case of a terminally ill British child. Around 50 people were filmed standing outside Alder Hey hospital last night in protest at a judges ruling in favour of switching off the child's life support. 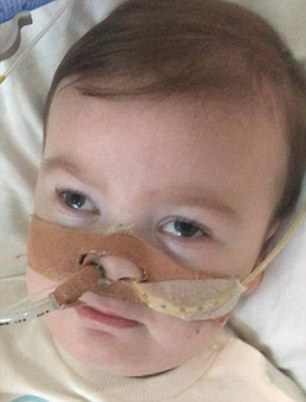 In the footage the group sing Hero by Mariah Carey as cars and vans sound their horns in support of the tiny tot.Last July he spoke out on behalf of Charlie Gard, who died of a rare genetic disease after a vicious court battle in which his parents sought treatment first in the United States and then Italy. The High Court, Court of Appeal, Supreme Court and European Court of Human Rights have previously accepted the opinion of doctors, who say Alfie's condition is irreversible. Alfie, now 23 months old, is in a 'semi-vegetative state' at Alder Hey Children's Hospital in Liverpool as the result of a degenerative neurological condition that doctors have been unable to definitively identify. Motorbikes rode up and down the road and campaigners held signs in support of the brain damaged youngster outside of the hospital. Speaking outside the hospital on Friday, Alfie's father Tom Evans, 21, said he had chartered a jet to take the child to Italy but had been stopped by the hospital. 'If he stays here and dies, he dies,' Evans said.